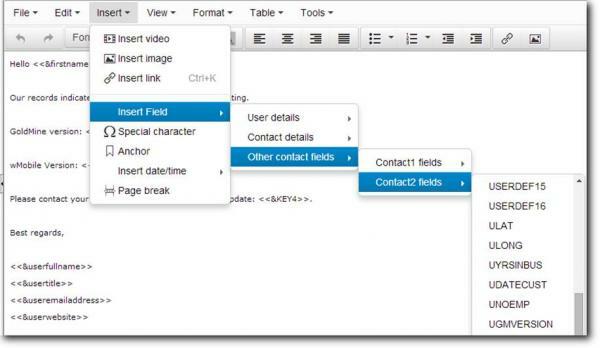 Recently, new functionality was added to form templates to provide additional fields that can be added. 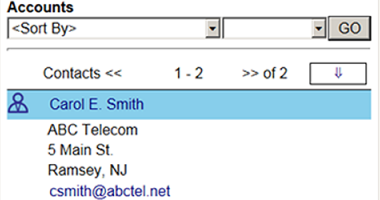 As you’ll see in the screenshot below, you can now add Contact1 and Contact2 fields. 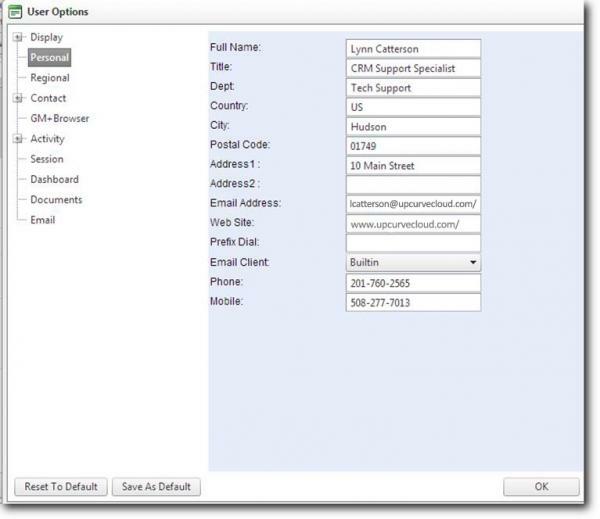 The Contact1 table contains all the fields built into GoldMine like Company, primary contact name, address fields, key fields, etc. 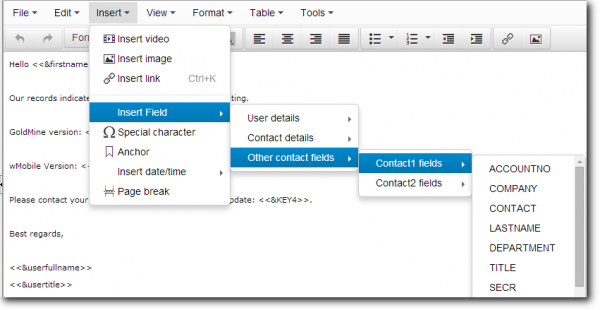 The Contact2 table contains custom fields that would have been created to store type of information you need to track on your customers. 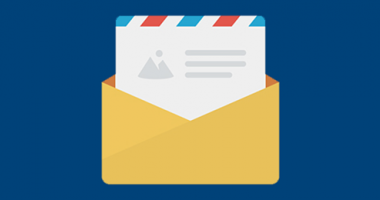 We’ve also made some improvements in the options to fill in user information such as the user’s department, title, phone, mobile, fax, email address, etc. That way you can create a template once, and anyone can use it, and it should fill in their information. A user would need to fill in this information in Tools | Options. Note: In GoldMine/Office templates, these user variables are set in the user.ini file in the GoldMine root directory. However, these days, we have many customers where users can only access GoldMine remotely and don’t have access to those user ‘ini’ files. 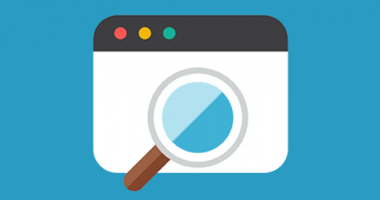 This method also provides a more user-friendly interface. Once these settings are filled in, they can be used in the wMobile Desktop templates. 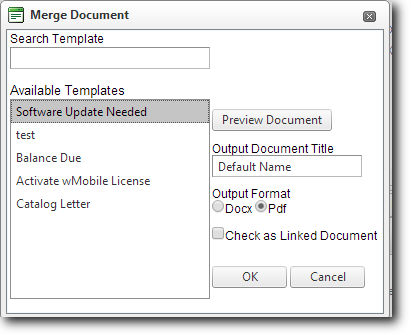 Use the Merge Template button on the contact toolbar to start a merge document. Note: You might have to use the toolbar navigation arrow at the right of the toolbar (highlighted in green in the screenshot below) if you don’t see the Merge Document button. Select a template from the list. Give the document a logical name. 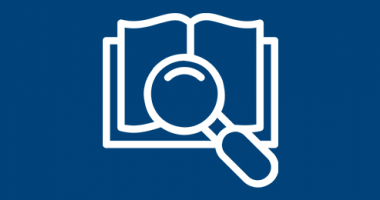 The document can be previewed or Output in Docx (which will allow editing) or pdf format. 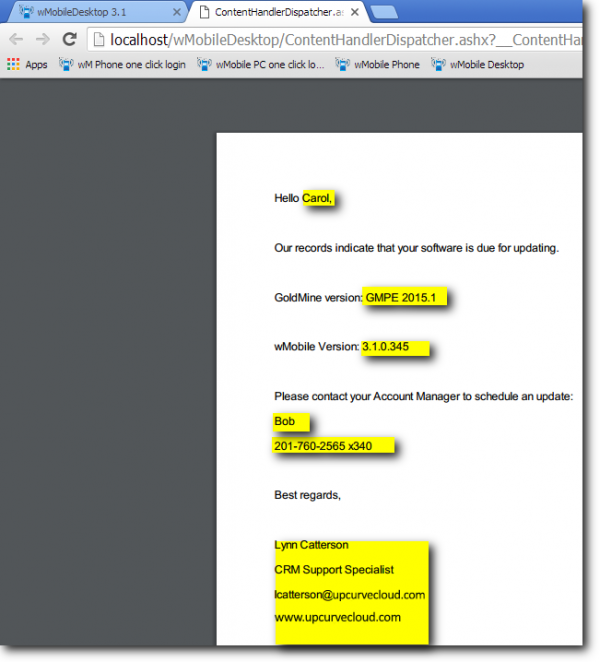 You can optionally link the merged document as a Linked Document on the GoldMine record. 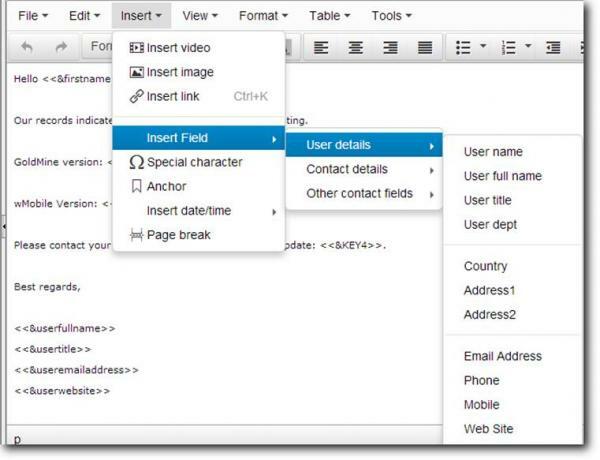 If the document is output to Word or Pdf, then the document will be created. Different browsers display this in different ways. 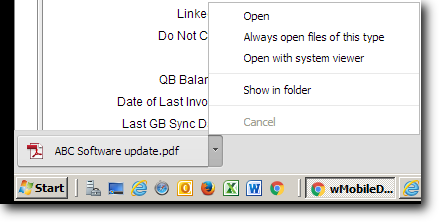 Depending on your browser, you’ll be prompted to open or save the document. 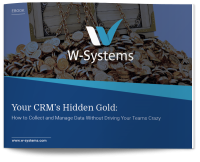 We hope that you’ll find this increased functionality useful in your business practices.